Providing you the best range of klip lock vista spice box with effective & timely delivery. 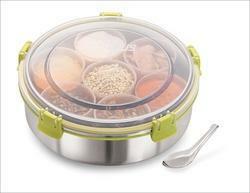 The masala dabba we offer is compartmentalized in several sections which helps in keeping the spices in clean and ordered manner. It is made from stainless steel to a matte finish.